This is an evil evil post!!!! Now I have to go out and get me some green mangos and bagoong!!! I am indeed salivating at the pictures and your most apt description. I do not think I have ever felt this way looking at my computer monitor. I have a bagoong stash in my refrigerator but, where or where, can I get the right green mangoes in Houston???? Oh! my goodness, I am salivating. Looking at the monitor at 10pm California time is not fair to feel this way. My whole body just went limp ( ha! ha! ha!). Argh…. you’re killing me…1 am and salivating like a rabid dog. MarketMan, that’s my usual pasalubong for my ManileÃ±o friends. Everytime I fly there, I get a request for a few BIG bottles to bring for them. They bring the raw shrimp from Zamboanga and the granddaughter of the original Alavar’s owner cooks it in Cebu by herself. I know she uses “gata” but as to what proportion, that’s another story. Really good also for “kare kare”, and pinakbet. I always have a bottle or two at home. Ah, good to know I’m not the only one who likes to eat her green mango with bagoong AND salt… But once I’m done, I always end up drinking so much water that I start to feel sick, urg. you’re absolutely right, MM..the pictures are enough to make any pinoy salivate. i think pinoys are wired for this kind of pavlovian response to the pairing, huh? now, if only somebody would bring out the ox tail kare-kare, steamed shrimps, and grilled boneless bangus, this would be a perfect sunday! i love the unique alavar’s bagoong (yes, it has coocnut milk), but i also love their alavar sauce – i think it has some curry in it, and maybe some mashed squash and coconut milk, but that’s as far as i would venture to guess. it’s great with fish fillet, or mixed seafood like clams, squid, shrimps and crab, or simply sauteed with some fried cubed tofu if you’re trying to be good. it’s sold frozen in half-kilo and 1 kilo plastic bags. I AM SALIVATING!!!! And to think I can’t eat bagoong since I’m allergic to crustaceans! I agree with Leo. This is indeed an evil post. I am now craving for the U.P. Shopping Center green mango on a stick. The guy there ads spicy salt in the bagoong. I see him mix siling labuyo with the salt. Yum, yum. Yay,*drool*! Is there an Alavar branch in Manila? 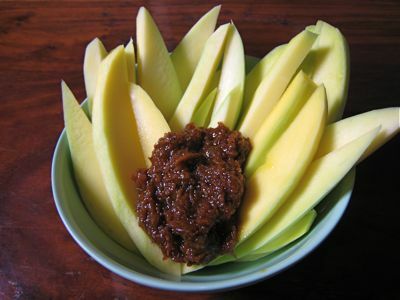 green mango and bagoong… what a great combination! sarap.. hope green mangoes are aplenty in december! Haven’t tried Alavar’s though. Whenever we buy bottled bagoong, we cook it again to add spiciness or sweetness. Oh my gosh, MM!!! Don’t do this to a pregnant woman…especially in her 1st trimester…Hehehehe….Now, I have to send off my hubby to look for some green mangoes….can’t wait!!! mmmm…..mouth puckering..i want some RIGHT NOW! ahhh!!! this post made me want to go home!!! !i’m salivating w/ this post…. MM strikes again with the Pavlovian post. I have a precious jar of alavar bagoong at home, ready for those green mango moments. The gata they add to the basic bagoong recipe cuts the brininess or perhaps the malansa of the shrimp. A friend always brings a crate of them back from Zamboanga around xmas to sell or to give away. If anyone wants them it’s easy to get them to Manila. As soon as I saw the picture, I held my breath and started to feel hungry for home and green mangoes & bagoong. I have a question for the US-based readers: what variety of mango would you eat with bagoong here? Like all of you, I’m also drooling like a dog on a hot summer day at the sight of the pics. Btw, what’s the difference between bagoong and ginamos? What a coincidence that after reading your post I saw huge green mangoes while walking along Bowery. I was salivating all the way home while thinking of my prize find! To my disappointment they were even milder than our Indian mangoes I might as well be eating cucumber or jicama with alamang. I am from Zamboanga City and yes, Alavar’s bagoong is the best there is. With green mangoes, grilled samaral or any grilled firm fleshed fish for that matter (or even grilled pork belly), some agar agar salad on the side and lots and lots of freshly cooked rice. Yum! You can make your own version of Thai bagoong rice with Alavar’s bagoong that is to die for. I wanna go home to Zamboanga tuloy. MM, you’re so cruel!! having us salivate, drool at your pics.. where oh where do i get alavar bagoong in manila or quezon city or kahit saan basta sa pilipinas?..tell me quick!!! please!!! makes me think of the almost hundred-year old mango tree in our backyard in Bacolod, where 2 large pieces can weigh more than a kilo… masarap i pares sa binayo na ginamos. not really a big fan of green mangoes because of the “ngilo” effect, but your picture is really something. just like what the others said, pavlovian effect… hi corrine,there’s an alavar branch along Scout Ybardollaza in QC. not so sure though if its still open. last time we were there was December 2007.
there are mangoes where i am but no bagoong…wahhhhh i really miss home (but two more months though) and you are right Mr MM, i am salivating! can’t concentrate on my work!!! wanted to stare the whole day on this picture!!! I haven’t tasted Alavar’s but that’s how bagoong is prepared in Zamboanga–with “gata”. But as far as my taste buds go, I still prefer bagoong without gata. Manga at bagoong, wow that picture surely leaves me salivating. “kalami”!!!!! i heart heart heart green mangoes + bagoong. you just made me hungry MM! ohhh, my hubby would die for those mangoes. Whenever we’re going back here from Manila, he would insist on bringing a kilo or two of those really green, crunchy mangoes that seems to be only available in the Philippines. OMG, This is pure torture for people like us who do not have access to this kind of food. I say ban the picture. I could not concentrate on the work. Just thinking of when will I be able to have the taste of Mangga’t bagoong. The mangoes we get here in North America is a poor imitation of Filipino mangoes. One of life’s simple pleasure. Haha I had to scroll down quickly because my saliva glands were agitated. My psychology teacher used to take green mango/bagoong to explain Pavlov’s experiment with the dogs. *drools uncontrollably* When I first came to the US, the first thing I missed eating was mangga and bagoong. Sure we had the bagoong, but where in the heck was I going to get sour, green mangoes in the burbs? Sour green apples were a barely passable substitue. School friends would FLIP when I’d shake salt onto my Granny Smith. But thankfully, the Asian – specifically, the Vietnamese – population in my area is now quite huge. I can now get sour(ish) green mangoes. We are going back to the PHilippines for a visit at the end of the month. I’ve already requested that a bushel of green mangoes and a jar of garlicky, spicy bagooong be waiting. THat and kilos and kilos of lanzones. You are soooooooooo correct, MM. The picture alone makes me drool!!! yum yum…which a question just popped out of my head, is there an english description or equivalent meaning to ‘naglilihi’? you know, when pregnant women crave for manggang hilaw in several ways of sawsawan. I’ve heard of manggang hilaw dipped in soysauce and plenty of sugar, in vinegar with sili, in asin and chopped sili, in just plin sugar, even in ice cream, etc…. this is too much!!! now i want to have that taste of alavar’s bagoong and green mango. my wife is in manila now and she’s coming back to guam this saturday. where can she buy the alavar’s bagoong in manila? here on guam we can find green mangoes if it’s in season here. i have been an avid reader of your blog since i discovered it thru “iloveiloilo.com” of inday hami. love your blog!! i try to visit this blog everyday. Edwin, I am not sure if they sell this bagoong in Manila. But you may want to try a little baoong mixed with coconut oil, a touch of sugar and if you have it a touch of bottled aligue as a substitute…navyGOLF I think naglilihi is the equivalent of craving… though it isn’t as descriptive… maybe “pregnant food craving” is the closest? Am very curious to know what ice-cream advert that had “Frusen GlÃ¤dje” as its theme. It’s Swedish for frozen happines. The Swedes would never associate the frozen state with happiness. Love your mango photo – even my Swedish husband would salivate when he sees this. He loves that kind of bagoong you described. 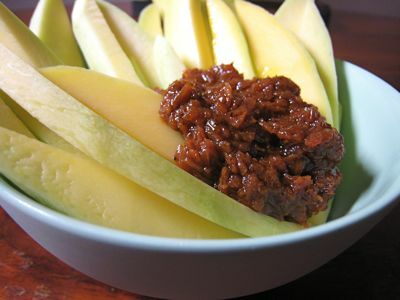 Why is it that even by just looking at a picture of mango and bagoong make one salivate/drool? I really envy you for having a taste oh not really a taste but for eating all this delicious food and having easy access to it all. I do use coconut oil (exported from Mt. Arayat) in sauteing my bagoong. And yes, one time I actually added coconut creme; and now I will try to add aligue (I just hope the bottled one sold here is good enough). Now all I need is the “real” carabao mango. Hindi yung mangoes that are sold here, na malalaki, sus naman ang lasa. Matabang na, matigas pa, at.. malitid. On my annual mission trip/vacation there, my first lunch that I asked my friend to serve me (right upon setting food in Manila) is pritong galunggong plus manggo and bagoong. Hayyy buhay. ECC, I am here in Houston too. Sometimes, the little mangoes (from Chile) sold by HEB is still in its green stage. Yung bagong dating pa lang. You will have to be lucky to get it, kasi they really sold it for its ripeness, matamis kasi. Some stores especially the ones within the Filipino community sells it as “Manila Mango”. And equivalent of our manggang piko. it’s been a while and this post really got me going again…. no combination quite like this two….good with salted red eggs….yummy! as soon as i arrive there in december, i would like to have lots of green mangoes and ginisang bagoong. hopefully, they’re still in season in december. I have always enjoyed my visit to your blogs, let alone the eyeball beauty of your fotos and very interesting write ups. w/ a pinoy cook slant(bagoong & a little coconut sambol). fruit. The leaves looked like a mango tree but all I see right now are bloody gumnuts!!! L.O.L. now i’m salivating. mr. marketman, what have you done to me? I saw these photos days ago, and still I come to look and gawked at it.. still get the same effect… drool, drool, drool, even its early in the morning here in Texas. I really, really must go to the Vietnamese market this afternoon and get me some mangoes and bottled bagoong to cook. Good thing I still have propane in my small hibachi, coz I have to cook the bagoong outside the house. Umm, I still have a can of Thai brand coconut creme..In the meantime,I’ll just go back to the photos and daydream. i had some for dinner. Thanks for the wonderful comments about Alavar Bagoong Gata and Alavar Sauce. By the way,i’m Miguel Alavar III,owner of Alavar Foods. If you want to order any of our products e-mail me at a9_alavar@yahoo.com or you may call (062)992-5781 and look for me. Yes,indeed! Alavar Bagoong Gata and Green Mangoes are the ‘Perfect Combination’. For Bagoong lovers, a must try is Bagoong Club at 122 Scout Dr. Lazcano, Sacred Heart, QC (it’s one of the streets in Tomas Morato area). Can’t really get green mangoes here. How can I get some of these Mangos? My saliva starts to roll-out of my mouth! a half-riped mangoes with bagoong!! AAhhhhh! that sour oriented piece chopped with succulent and literally deep slight sweet and sour mixture of taste,,what a dream to eat those slices! Its been 15 years that i never tasted it! im rude to admit the truth but i really missed it so much! i hope to visit philippines during mango season..My wife look at me strangely when im trying to describe her what is that mango is? she never seen it before as her country has no mangoes at all, they never know what is mango is except on photos, my wife should be surprised later to know that i have 2 trees of this mango tree back home!!!…. Bagoong is that not made from anchovies and it has purplish brownish colour? Alamang is a shrimp paste with pikish colour. Oh, I just remembered, she also cooks our crabs in a similar way. Boil the coconut milk or gata together with the bagoong. After the first boil, add the crabs and when it’s almost done (say, a minute or so to go) add the coconut cream or kakang gata. yum! I have just been diagnosed as hypertensive and diabetic and been browsing of the effect of unripe mangoes to those illness in the internet. I love unripe mangoes and I can eat one after another without suffering from acid reflux which I got from eating even a tiny slice of banana or pineapple. Finally after five years of waiting, the mango trees that I planted adjacent to my property bear fruits. Whenever I have the urge to eat unripe mango I just pick few from the tree and I like the small ones that the seeds are not fully matured. Only that instead of Bagoong I just mixed it with tomatoes and onions dipped in Soy sauce. Too bad, I think unripe mangoes are not allowed in airports. bakit bagoong ang tawag nyo jan? eh shrimp paste yan, alamang sa tagalog!